Singapore’s market will restart trade on Wednesday after closing for the Labour Day holiday on Tuesday, with a weak lead from Wall Street and Japanese shares and concerns from a newly resurgent U.S. dollar. Japan’s shares opened a tad up on Wednesday, edging up just 0.055 percent at 8:09 A.M. SGT. The Dow Jones Industrial Average ended down 0.27 percent, the S&P 500 ended up 0.25 percent and the Nasdaq climbed 0.91 percent. Futures for the three major indexes were only a tad positive around 7:50 A.M. SGT on Wednesday. “After initially grumbling on Pfizer results and dropping oil prices, U.S. equity market rebounded convincingly in Tuesday’s NY session, but investors remain cautious that tariffs and higher oil prices could increase cost pressures and weigh on corporate profits, not to mention the negative equity market connotations from the prospects of higher U.S. interest rates as the Federal Reserve Board concludes its two-day policy meeting,” Stephen Innes, head of Asia Pacific trading at OANDA, said in a note on Wednesday. Technology shares, especially Apple suppliers, may get a sentiment fillip after Apple reported first-quarter earnings that beat expectations, even though sales of the iPhone X came in a tad below some analysts’ forecasts, but still up from the year earlier. Shares sensitive to the U.S. dollar may be in focus after the U.S. dollar index, which measures the greenback against a basket of currencies, climbed overnight. The dollar index was at 92.4780 as of 7:58 A.M. SGT, compared with levels under 92 earlier in the week. The U.S. dollar was fetching S$1.3337 at 8:30 A.M. SGT, after trading under S$1.33 last week. CapitaLand reported first-quarter profit after tax and minority interests (PATMI) of S$319.1 million, down 18.8 percent on-year, due to a year-earlier gain of S$160.9 million from the sale of 45 units of The Nassim project. Excluding that gain, PATMI would have been 38 percent higher, the developer said in a filing to SGX on Monday after the market close. That was on higher development profit in Singapore and higher rental income from malls and offices in China, Japan and Germany, it said. 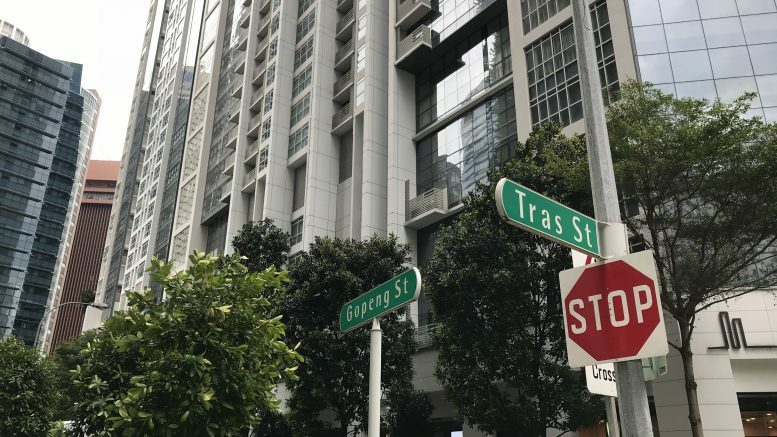 CapitaLand said it sold 40 units in Singapore, based on options exercised, worth S$150 million in the first quarter, down from 84 units valued at S$504 million in the year-earlier quarter. But it added that around 98 percent of launched units were sold as of the end of the first quarter. SPH REIT inked a deal to buy The Rail Mall on Upper Bukit Timah Road in Singapore for S$63.238 million, the REIT manager said in a filing to SGX after the market closed on Monday. The Rail Mall has 43 single-storey shop units and 95 private carpark lots, with about 360 meters of main road frontage, the filing said. It is located near the Hillview MRT station. City Developments said it was on track for its sustainability goals, including for carbon-emissions and energy-use intensity. It achieved a 32.8 percent reduction in carbon emissions intensity from 2007 levels, on track for its target of 38 percent by 2030, the developer said in an SGX filing on Wednesday before the market open. It also said it achieved a 27.3 percent cut in energy use intensity from 2007 levels, reaching its 2030 target of 25 percent early.